The Modern Grass has been creating quite a stir in the Canadian music scene since this group of five musicians came together in 2011. They’ve already had a successful Canadian tour and their debut album, The Modern Grass Quartet, was nominated for Music Nova Scotia’s Best Country/Bluegrass album of the year in 2011. 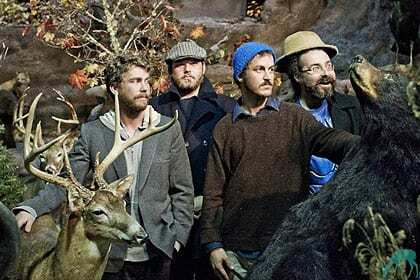 They followed that up with a second album, High on the Mountain, earlier this year. The Modern Grass features Donald Maclennan, Adam Pye, Andrew Sneddon, Dan MacCormack and Tom Terrell. The Quintet plays tribute to various musical traditions putting an acoustic spin on a mix of jazz, bluegrass, gypsy, blues, classical, and folk music. Seamlessly translating complex arrangements, adding their own innovation and improvisation, and then including Terrell’s down home songs and lyrics result in a distinctive and reassuring contrast. The Modern Grass in a breath of fresh air.